Children can get breakfast with their books during the half-term holidays at several local libraries as the popular scheme returns to Sandwell. 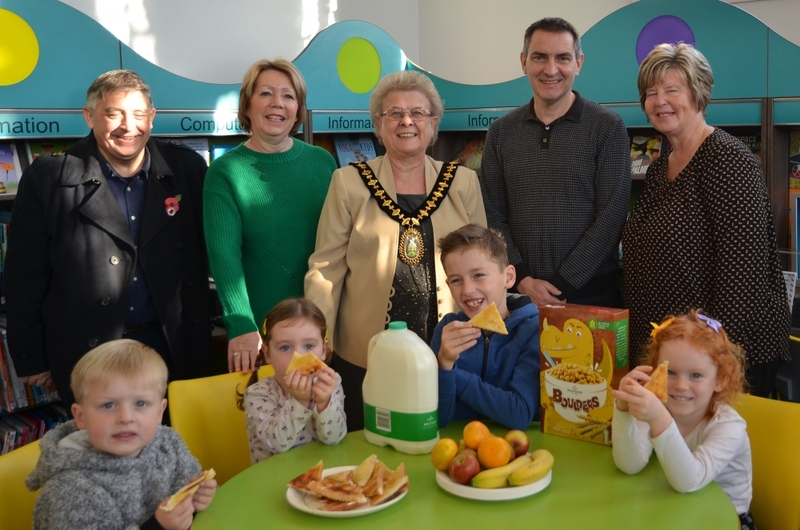 The Mayor of Sandwell, Councillor Joy Edis came along to the first Cereal Readers session at Wednesbury Library where breakfast was donated by Morrisons in Wednesbury. Cereal Readers is a library initiative in which children and their parents and carers are invited to share a bowl of cereal, some fruit and toast as they take part in book related activities at the library during school holidays. Councillor Pam Hughes, town chair for Wednesbury also came to Wednesbury library. She said: "It's such a great scheme and I'd like to thank Morrisons in Wednesbury for their very kind donations. I'd also like to thank the hard-working staff at Wednesbury Library for hosting this wonderful event during the school holiday." Children can get their breakfast from libraries in Cradley Heath, Blackheath, Glebefields, Oakham, Rounds Green, Stone Cross and Wednesbury each morning during library opening hours. Councillor Simon Hackett, cabinet member for children's services said: "It's great to see so many children are enjoying Cereal Readers and visiting libraries during the school holidays. “It’s so important that children learn to love books and reading. I urge parents and carers to bring their children along to the Cereal Reader sessions we have across Sandwell."